give a better description. I have been studying successful pages and online catalogs for better ways to describe my items. If anyone else sells on Etsy please share your story. I just completed a beautiful shawl pattern. This is a paid pattern by Tsvetomira Ruskova for Avarus. The pattern name is The Harika Cowl Vest. It was a quick work up and it only took a day and a half to finish. 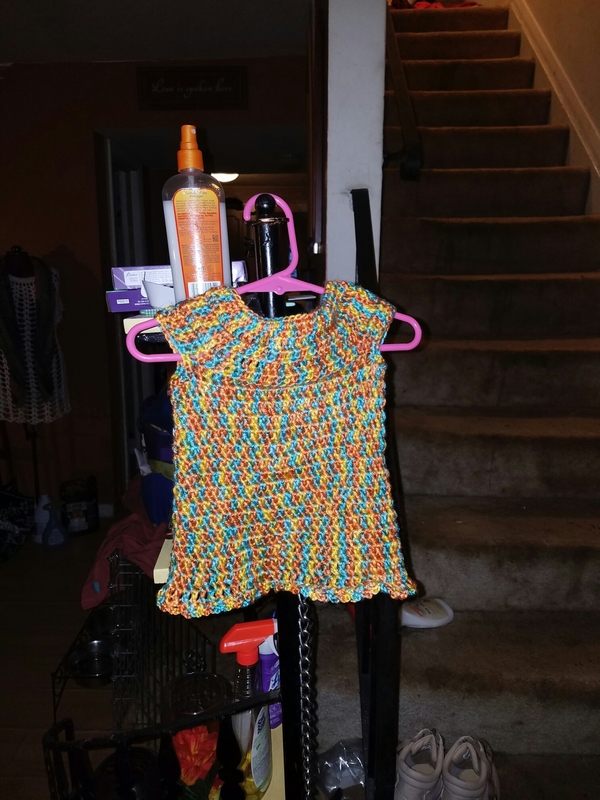 I modified mine by adding a row of single crochet around the edges to give it a cleaner edge. Without the single crochet edge it still had a fairly smooth look. I would definitely recommend this pattern to my fellow crocheters and I look forward to working this pattern up again. I plan to add this cute accessory to my Etsy page soon. I am so proud of myself. I haven’t bought a skein of yarn in 2017 (Yay me!). I am planning on moving this year closer to my family and hopefully one step closer to my dream house. I have made a decision to purge and my yarn collection is embarrassing (it is borderline a need for an episode of Hoarders). I have been diligently working on projects in hopes to diminish my stash before my move (if I don’t it is going to take one U-Haul trip for yarn alone). I have made a conscious decision to budget what I spend on yarn. This is hard for me so please pray I keep it up. Now I will spend money on patterns; however, I love, love, love the free pattern options on this website. I have found some beautiful patterns and most come with some type of Youtube tutorial. If you haven’t been there go check it out!! Late last year I had to have my basement waterproof. By God’s grace this was an expense covered by my HOA. My only responsibility was to move everything away from the walls. Although this may seem simple enough (especially when you are saving thousands of dollars) this became a daunting task. My basement had become a dumping ground for everything I thought I needed at every thriftstore, bargain sale, yard sale, deal, etc. and it wasn’t pretty. Werks I worked and worked to no avail. Exactly 3 days before the crew would come to complete the work my 2 uncles (bless their hearts) came and helped me move all this stuff into the middle of the basement. As this happened I realized (and they were my amen section) how much unused space was in my basement. All my money woes were stacked in the middle of my basement. I was headed to hoarder rehab if I didn’t get my act together. Then I saw it, a vision of a craft cave (something like a man cave but for a crafter). It has been my motivation. Donation pick up after donation pick up, I am slowly but surely purging through the “I might need that one day” pile. I am too embarrassed to put up a picture (I will do a before and after once it is complete). However, it has made me stay away from stuff I don’t need in the thriftstore and I avoid yard sales these days. I have chastised myself repeatedly when I open a bin and it burps yarn. I HAVE NOT BEEN ABLE TO KICK MY YARN BUYING HABIT. I have slowed down tremendously though (hey thats a step). I am thoroughly excited about getting a yarn room. I know its going to be worth all this work. I have been struggling with not buying yarn. My yarn store frequently has great sales and I simply can’t resist. I already have more yarn then I can use in my lifetime (which is still not enough to me). I have considered quitting my job and making this my full-time business. However, when I discuss this with my partners; mortgage company, electric bill, car payment, car insurance, etc. they say I have to keep my good government job. 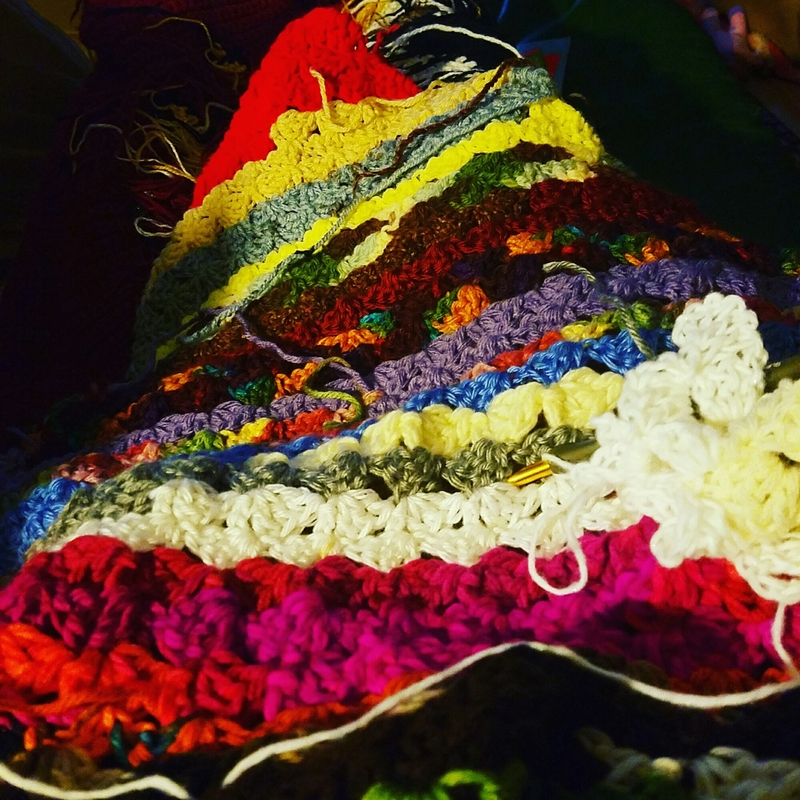 I work on my eclectic blanket to use up yarn scraps just to make it seem like I am putting a dent in my yarn collection. Pretty soon I am going to need a storage unit to hold my yarn. I am currently working through patterns in my pattern collection books. I am hoping to organize my finished products for sale on Etsy by the end of next month (pray for me). I have recently lost interest in taking special orders and really just want to focus on working on patterns that interest me. I know this is a phase and hope that once I get my Etsy store stocked up, I will get back in the swing. My eclectic blanket in progress.